Christmas is less than two weeks away and you probably still have last minute gifts to buy, so we have taken away the stress of finding your Secret Santa or stocking fillers. You’ll be spoilt for choice with these top five amazing gifts handpicked for you, plus they are all under £18! Want to help a loved one or colleague switch to vaping? What better gift than the DOT Vape Kit. This kit is designed to help make the switch to vaping. 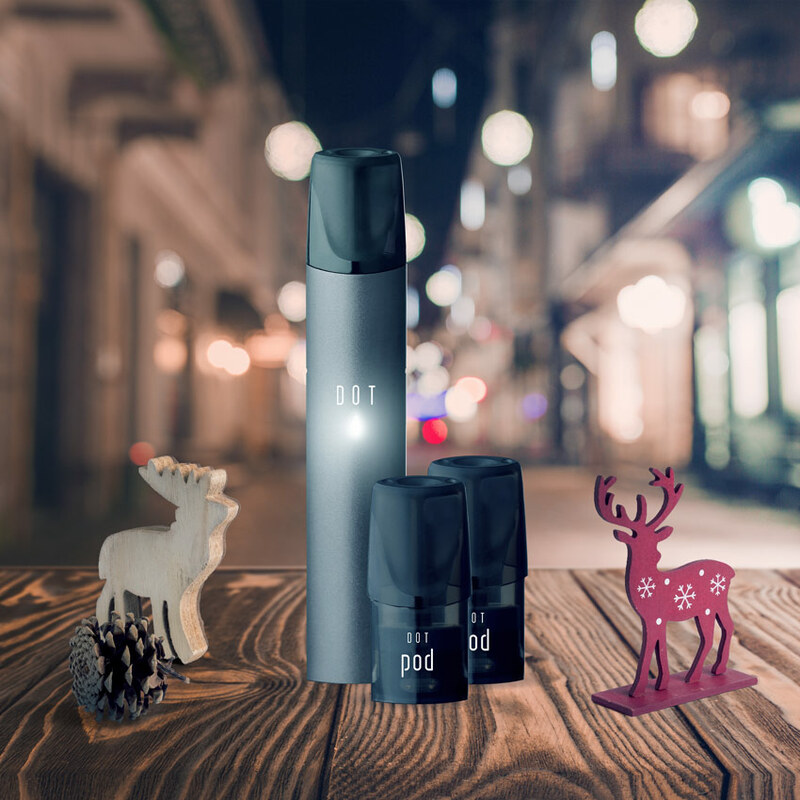 The DOT Vape Kit is a compact, stylish and easy to use vape device that harnesses the latest technology, providing a smooth and satisfying vape. The pre-filled pods contain 20mg/ml strength nicotine salt, which is a variation of nicotine traditionally found in e-liquids, which creates a smoother vape. Know a vaper who likes mentholated fruit flavours? Our Christmas Crush Collection is a festive celebration of our flavoursome fruit, crushed with a glaze of ice, straight from the North Pole! 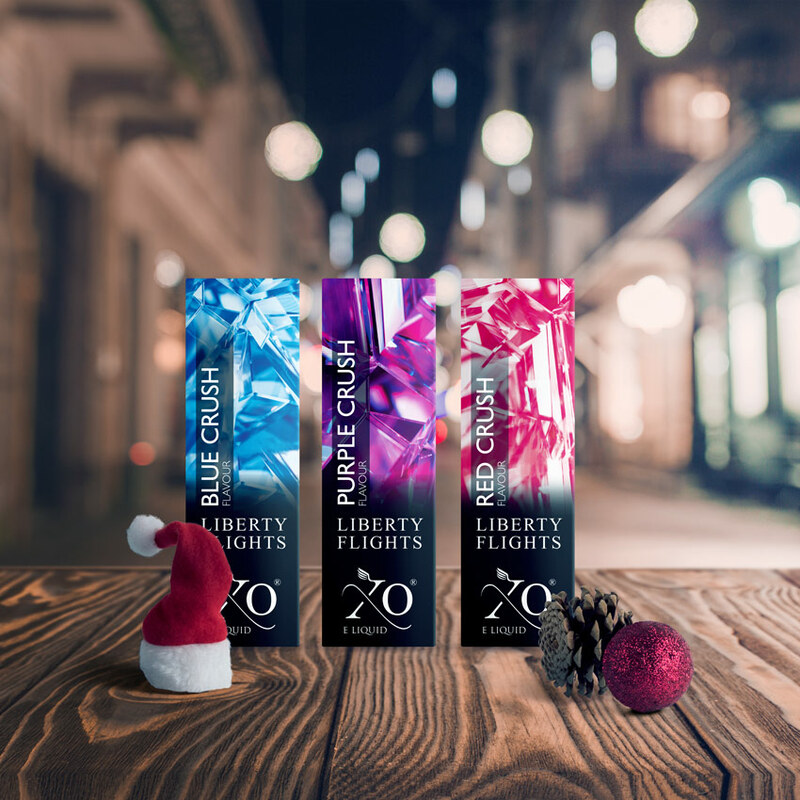 This collection contains the popular Blue Crush, Purple Crush and Red Crush flavours and can be purchased in a 0.6%, 1.2% or 1.8% nicotine strength. Know someone who likes to blow a cloud or two? Then this collection is for them. 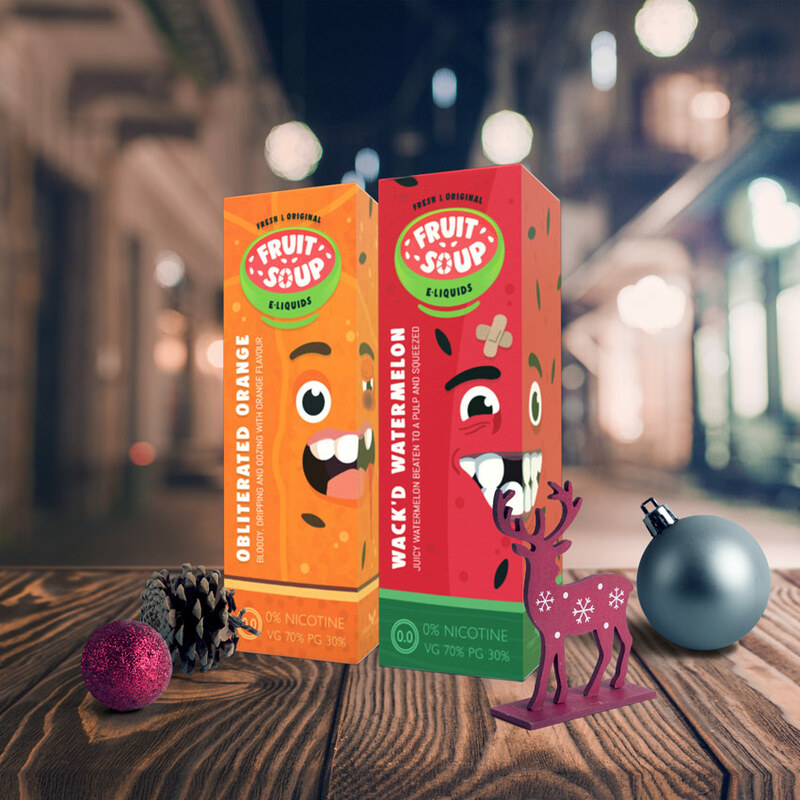 Fruit Soup brings you a delectable range of fruity flavoured short fill e-liquids that will positively rattle your taste buds. Christmas can be a stressful time for most people. Juggling Christmas shopping, decorating trees and enjoying the Christmas festivities. 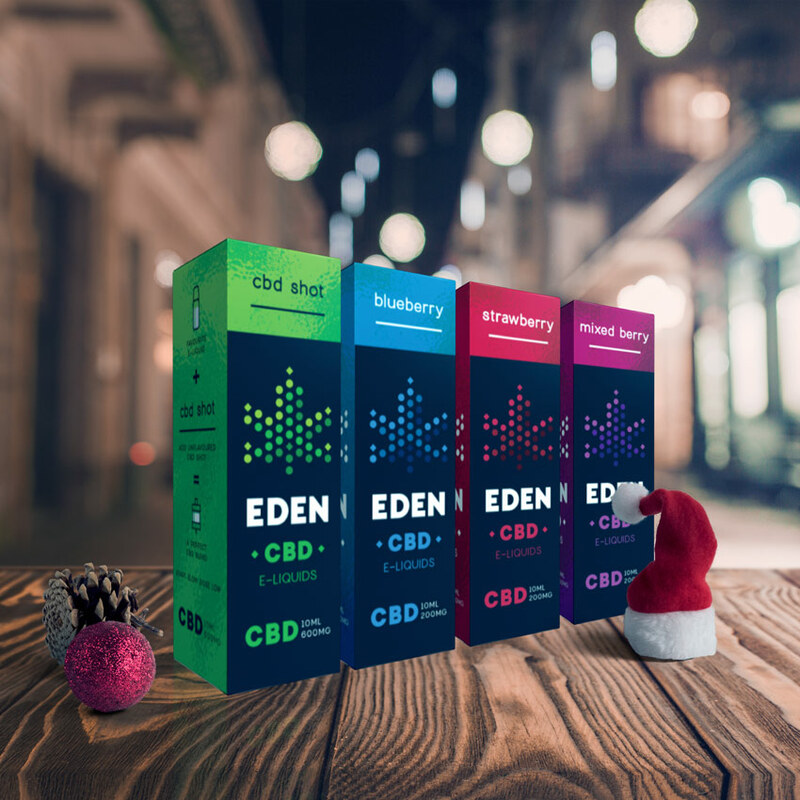 EDEN CBD would make the ideal gift for an existing vaper, helping them support their body’s Endocannabinoid system and helping to create balance. Our XO Shortfills are supersized versions of our popular 10ml flavours. There are 13 flavours to choose from and would make an ideal treat for someone who vapes high VG and low strengths of nicotine. These are all 100ml e-liquids in a 0% nicotine strength and for less than £20 you could include a nicotine shot too! So, there you have it, we have your Christmas all wrapped up! Are you new to e-cigarettes, or deciding on changing your smoking habits for a better life? Cited as the most popular quitting aid in England, electronic cigarettes are a viable choice for existing smokers who wish to give up, even the NHS agree. With just 15.5% of adults in England using tobacco on a regular basis, the rate of smokers in the country has hit an all-time low, partly due to the widespread availability of vaping products. Despite this, smoking is still the leading cause of preventable illness and premature death in England. With a significant number of people still developing smoking-related illnesses, the Government has issued an updated Tobacco Control Plan, designed to deter people from taking up smoking and encourage existing smokers to quit. In this season of good will and peace to all men and women, I thought that it would be remiss of us to not take the time out to reflect and share the events as they unfolded on the day that our Chief Scientific Officer, Lucy Robins, was invited to speak on Sky News about battery safety. As members of the IBVTA, whose head office staff were in the midst of an office move, we received a call from Garry Dibley who asked if we could put anyone forward. The timing of this seemed to be perfect as the IBVTA had finished their guide to battery safety only this week and was circulating it for sign off so we agreed to the interview. Battery safety is something that not only affects our industry, but wider society. In September of this year I was shocked at my own ignorance to learn of the threat that ‘button’ batteries pose to small children if swallowed. Battery safety is something that has always been on the agenda for us when selecting products, especially now that we are manufacturing our own range of hardware however the rise of rechargeable, replaceable 18650 batteries over more recent years to power the bigger devices being marketed brought this issue to the fore. The interview was in response to a newly released video by the Fire service, showing a battery discharging in a man’s pocket after it was carried loose with coins. So in preparation we scoured the internet for media coverage. In order to gauge the tone of reporting we checked the big hitters (or usual suspects) first. The Daily Mail’s report was succinct and factual. No undue hyperbole. Not a reference to the morality of vaping or how vaping is a gateway to smoking or whether adults have the right to choose sweet flavoured e-liquid. They pretty much recanted the core message. Carry batteries safely and be aware of the dangers if not. The Global Forum on Nicotine (GFN) has been attracting stakeholders from around the globe for the past three years with GFN 2016 having participants from 44 countries including policy analysts, regulators, academics and researchers. The agenda for the conference brought together key industry professionals to present their research and hold rigorous and honest debates on a wide range of topics regarding nicotine and e-cigarettes. Liberty Flights Ltd. was represented by IBVTA (Independent British Vape Trade Association), and below we have summarised the presentations of interest from a few key speakers at the event. One of the speakers at this event was Lynne Dawkins who has been conducting research into e-cigarettes since 2010, her most recent study which she presented at the GFN was ‘Compensatory puffing behaviour in e-cigarette users’. As we all know in Article 20 of the TPD (Tobacco Products Directive) nicotine strength is limited to 20mg/ml and, around 9% of all of e-cigarette users currently use above that concentration. The experiment was to determine whether e-cigarette users self-titrate when given a lower concentration of e-liquid, to compensate for the reduced nicotine. E-cigarette users adjust their nicotine intake to maintain a personal optimal level in their system, this is usually achieved by puffing on the device for a couple of seconds longer or taking a few short, additional puffs straight after just to get that right hit. Two concentrations of e-liquids were used in this study one at 6mg/ml and the other at 24mg/ml, and there were a total of 11 e-cigarette users. All 11 participants followed the same procedure throughout the study which was repeated for both the lower and higher concentrations for each participant. The results published show that puff duration, amount of puffs and the volume of e-liquid consumed was approximately twice as much in the lower nicotine strength compared to the higher nicotine strength. Do papers ‘puff’ less when it comes to higher nicotine? Yes. The results from this study show that the mean puff number for 24mg/ml was approximately 50% lower than for 6mg/ml. From this we can see clear evidence of compensatory puffing when a lower nicotine e-liquid is used. The mean volume of 24mg/ml nicotine e-liquid consumed was also approximately 50% lower. Is there a difference between hit and satisfaction when varying nicotine concentrations? During the study participants rated the hit and satisfaction they got when using each e-liquid strength. 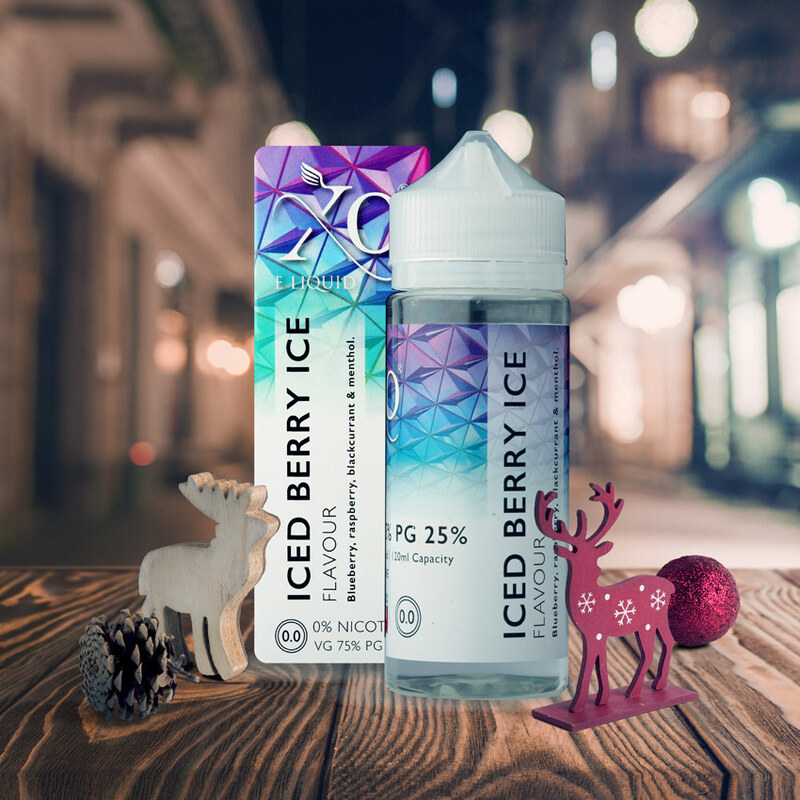 The general trend is that users get approximately a 63% hit and satisfaction rating in the 24mg/ml, compared to 47% if it is a 6mg/ml e-liquid. Fig 2. Hit and Satisfaction differences. Using this data, we can see the possible unintended consequences of the TPD regulations. New users that require that extra hit and satisfaction will find it even more difficult with nicotine concentrations below the 20mg/ml limit. This will generally make it harder for users to replicate the strong hit and satisfaction from traditional smoking which in turn may impact successful quit attempts. Christopher Russel Ph.D. focused his research on ‘how vapers help smokers quit’. Vaping anecdotes, when supplied on mass can become a reliable and credible source of information. This study focused on what users could do to help the next person quit, by sharing success stories and the benefits of vaping over traditional smoking. In 2015, 2.2 million people in Great Britain used an e-cigarette, of which approximately 38% had switched completely away from smoking to vaping. However, there are still 36% of smokers in Great Britain who have not yet tried using an e-cigarette. This shows there is a large potential to persuade more smokers to try e-cigarettes ultimately reducing tobacco related harm. What benefits of using e-cigarettes are experienced by users? In this questionnaire, a total of 200 participants were asked to select any of 83 listed potential health benefits and harms of switching to e-cigarettes. At the time of the study participants had not smoked traditional cigarettes for around 14 months with 96% vaping everyday using 1 to 12mg/ml e-liquid. Fig 3. Changes experienced since users started vaping. The figure above shows participants listed an improvement in their respiratory health as the top benefit from switching to e-cigarettes. Other benefits included improvements to mood, sleep and hygiene. Information like this could be instrumental in influencing a smoker’s decision to try e-cigarettes and ultimately switching completely. 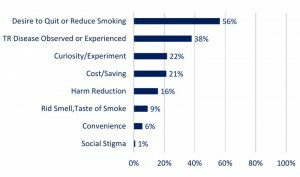 What are the main reasons for e-cigarette users quitting? Every e-cigarette user has their own personal reason for quitting, and the well-known risks attached to smoking lead many people to reduce if not quit completely. 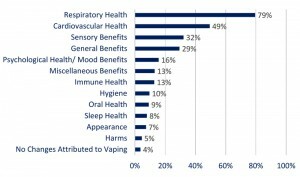 The figure shown below is users reasons for first trying an e-cigarette. Fig 4. Reasons for switching. The cost saving implications, smell and social stigma of smoking are just a few of the reasons many have made the switch, and this should now be relayed back to smokers that are aspiring to quit just to give them that extra push. However, they should be made aware not to expect miracles when switching and that the change can be slow before they quit the habit completely. What possible advice can be given to smokers aspiring to quit? A lot of e-cigarette users are experienced and knowledgeable in the potential benefits of e-cigarettes over traditional smoking already and this can be used for the benefit of traditional smokers to help them quit. Many smokers want to hear vapers stories and experiences of using an e-cigarette before making the leap. In this study participants were asked what advice they would give someone looking to make the switch and we have chosen a few examples. Are e-cigarettes a gateway to smoking or a roadblock? This topic is much discussed leading many people outside of the e-cigarette community to have the misconception that e-cigarettes act as a gateway to smoking. Neil McKeganey in his presentation, shed some light on this divisive issue. Neil McKeganey carried out a study in which 120, 16-28 year olds were interviewed. This study focused on the perception of e-cigarettes in the younger community, the initiation of trying an e-cigarette and the perception of harm from e-cigarettes. What do e-cigarette users have to say? Below are some examples of questions and answers recorded during the study. Question: What would happen if you couldn’t vape? Answer: I would probably smoke to be honest. Question: Would you say it is as harmful as cigarettes? Answer: I wouldn’t say it was as harmful as cigarettes as I would say that smoking cigarettes is really bad in that other people around can get affected. Vaping wouldn’t affect others as much because it isn’t as harmful as smoking. Most young people interviewed in this study saw vaping and smoking as being associated with very different harms. The predominant view within this study was that vaping had made smoking less attractive rather than more attractive implying that it is not a gateway to smoking. It may even be a gateway out of traditional smoking. YouTube: Vapers Helping Smokers to Quit.